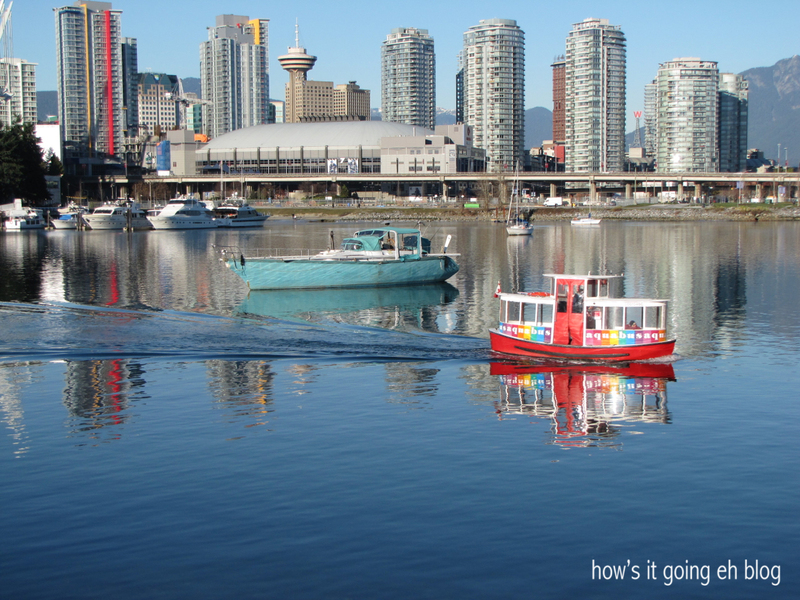 Portobello West Holiday Market – Vancouver | how's it going, eh? Hey hey heeeeeeey!!!! Holiday season is here! 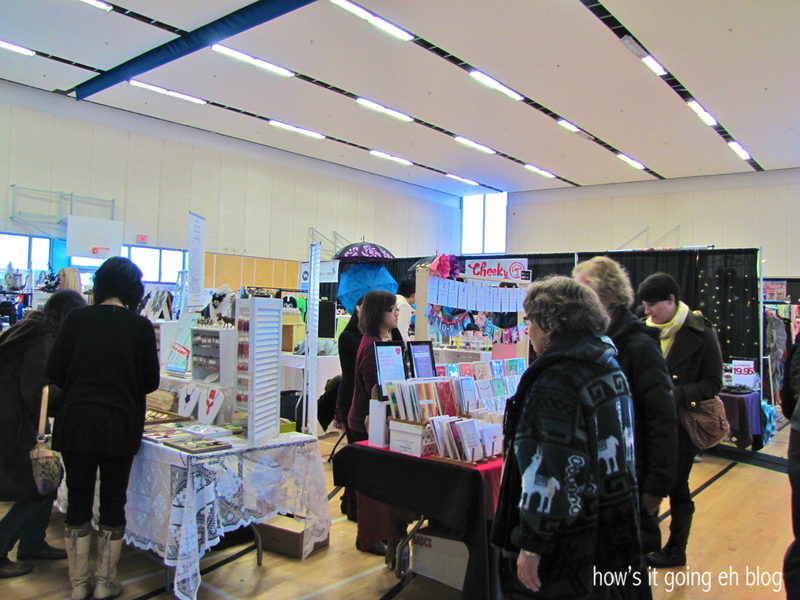 Avoid the malls + go a’ craft fair-ing!!! My new buddy M + I tried out the Portobello West Holiday Market this year. It’s located in the Olympic Village, which is all fancy + shiny – so I wanted to check it all out! All the vendors were set up in their little booths. There always tends to be vendors that have a similar theme which becomes redundant. And some questionable booths. Feather earrings? So 2 years ago! Chunky, knitted bow ties? No nononono. Thus, I’m only going to showcase the vendors that I lurved + got all excited about. This gal has her own hives + makes yummy, original honey! 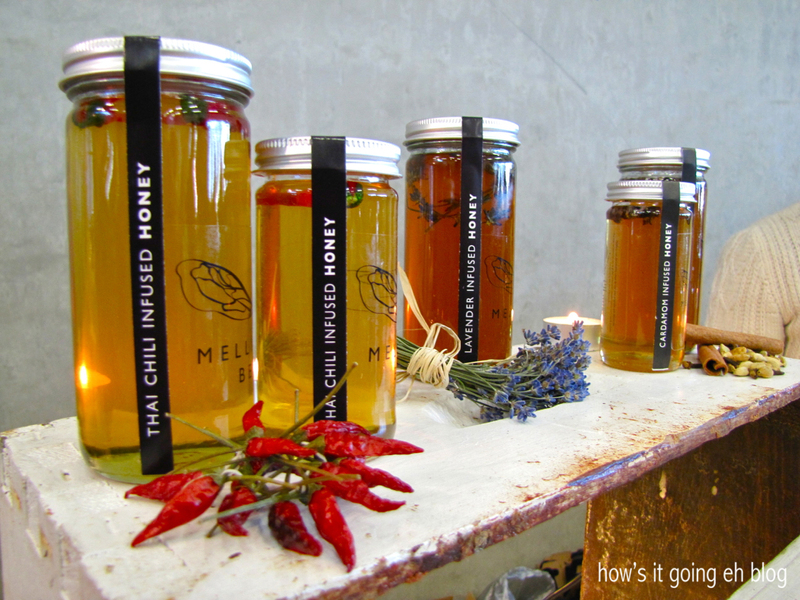 Mellifera Bees showcases various original infusions, like spicy honey, earthy cardamom honey, etc. I loved her merchandising! I bought about 5 lbs of honey in Alberta over the summer, so I had to refrain. M + I saw Le Fil Rouge at the Vancouver Home + Design Show. The designer is a charming German woman (she was the one who told us about the Portobello Market) who designs really high quality linen + Peruvian baby alpaca blankets, stoles, scarves + hats. I want EVERYTHING!!! I’m a huge fan!!! 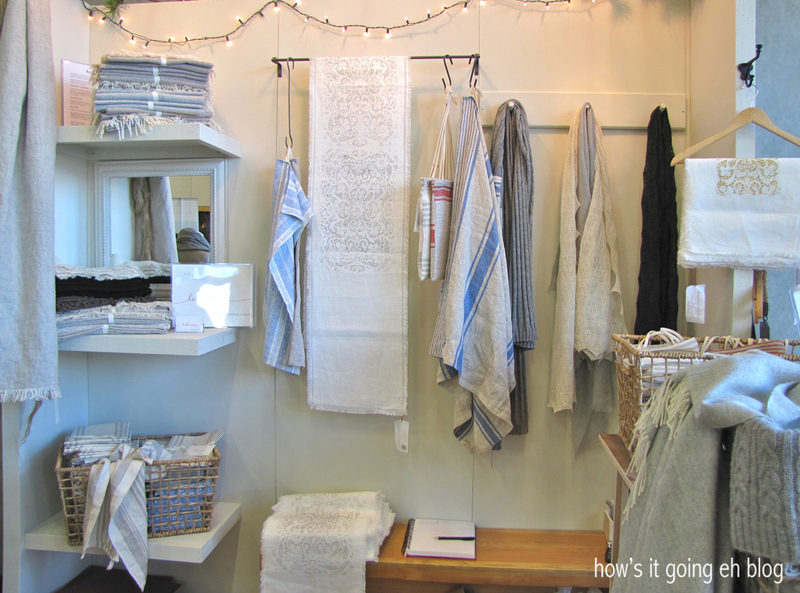 Wouldn’t it be so chic to have a row of the beautiful linen towels hanging in your bathroom? 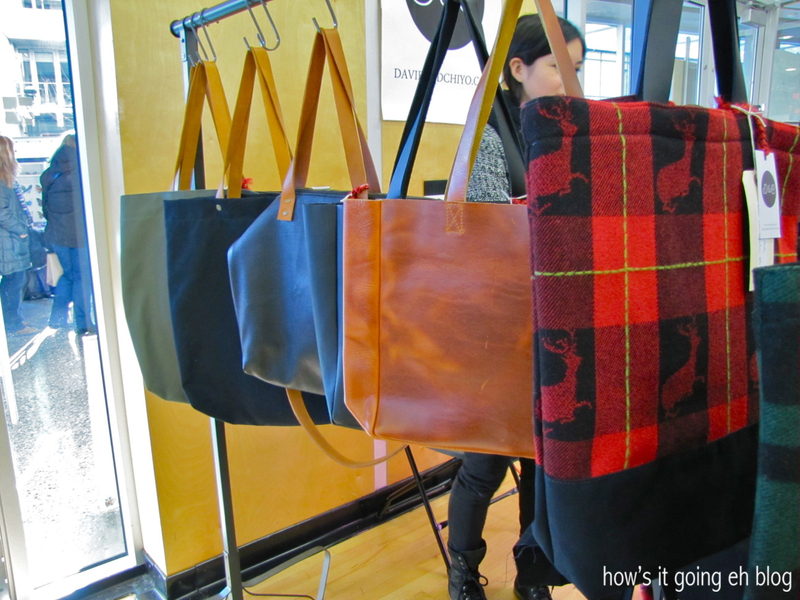 We were all about Davie + Chiyo bags that day. Simple, understated, extremely well crafted + high quality materials! The girls were Japanese + super sweet! They sew + manufacture all the goods themselves! Davie + Chiyo are also known for their wedding accessories, so check them out online! 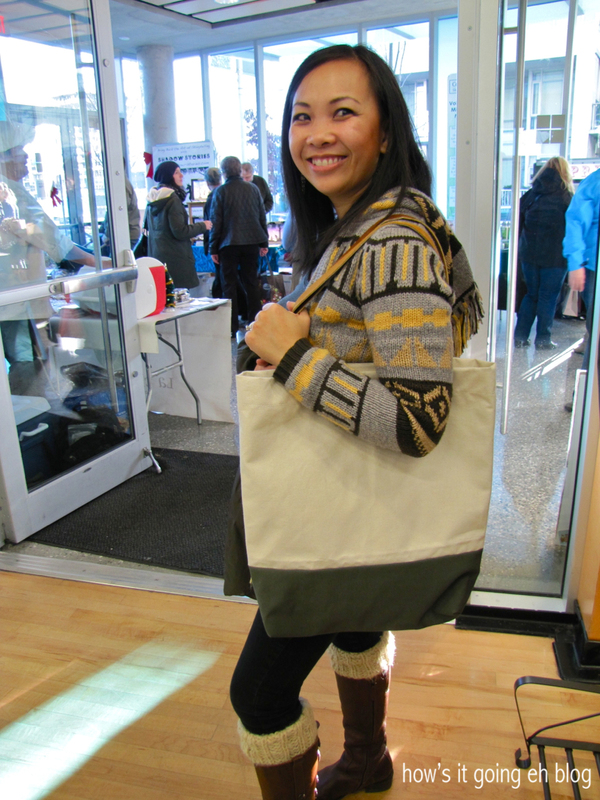 M bought a couple of their items – one of them being this adorbs tote bag! Adore! 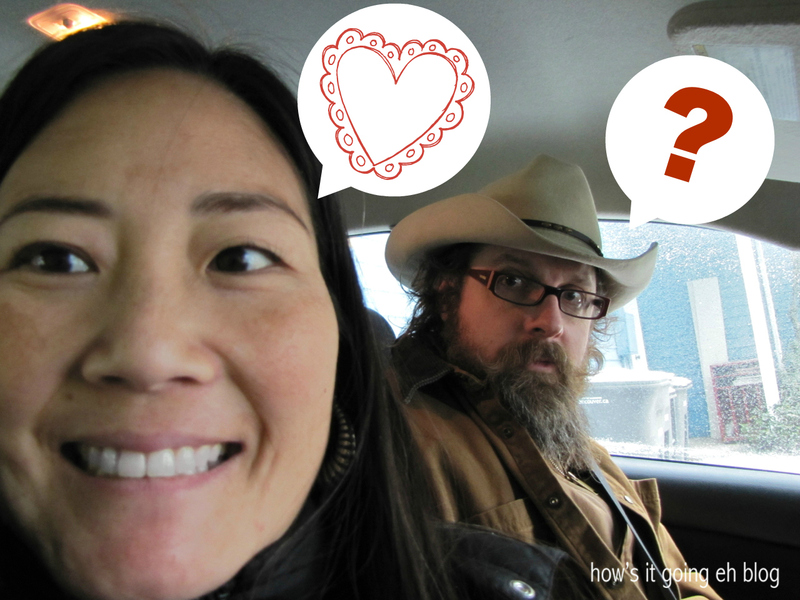 Stop by M’s awesome blog: Redesigned by M! Who says you can’t make friends through blogging! 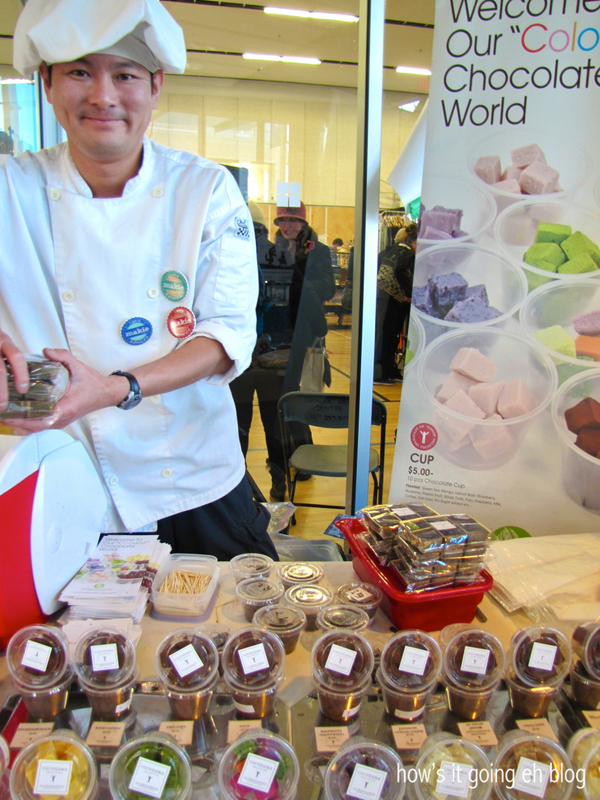 My favorite guy of the day, Taka of Coconama Chocolaterie!!! His booth was getting swamped with ladies wanting chocolates! Coconama chocolates are rich + luxurious with flavors like green tea, earl grey + even a spicy one! Although Taka was extremely busy, he took the time out to help me out with a Japanese translation, going so far as writing the Japanese character on his arm + looking up the word up on his iPhone! Service with a sweet smile! Portobello Holiday Market is relatively small, but we spent an hour + 1/2 in there browsing + having fun talking to the vendors. The weather in Vancouver has been unbelievable! Super cold, but bright, blue skies! If Vancouver was like this all the time I would complain 80% less than I do about the city! 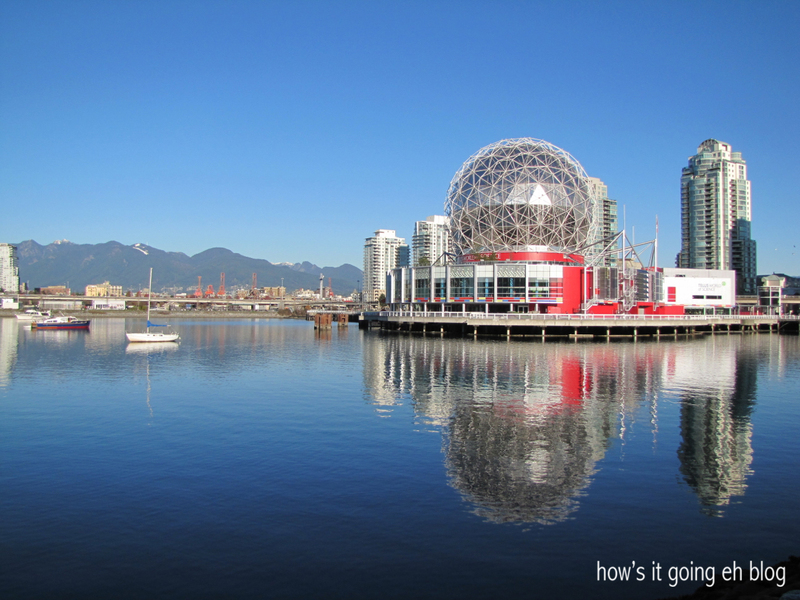 Here’s a view of Science World. Read my post about it here! There goes the water taxi! Put, put, put!!! 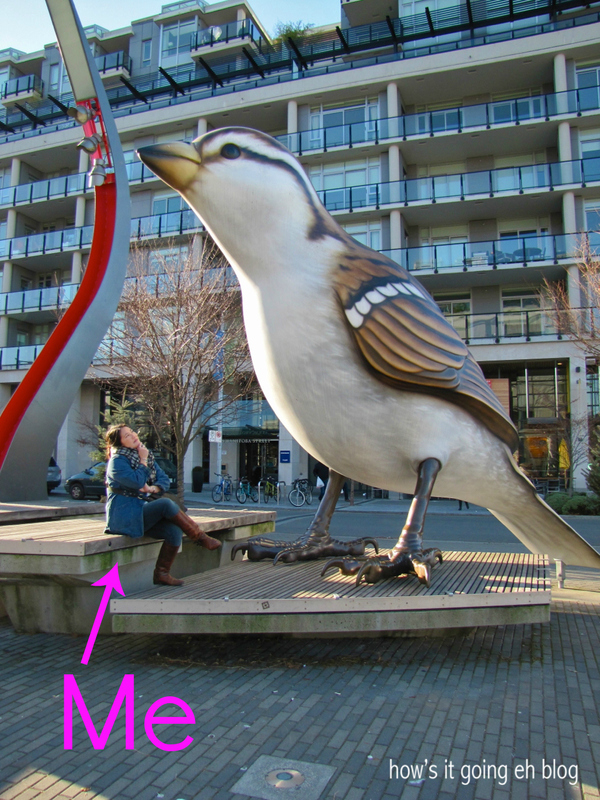 M + I walked over to check out the big birds in the middle of Olympic Village. 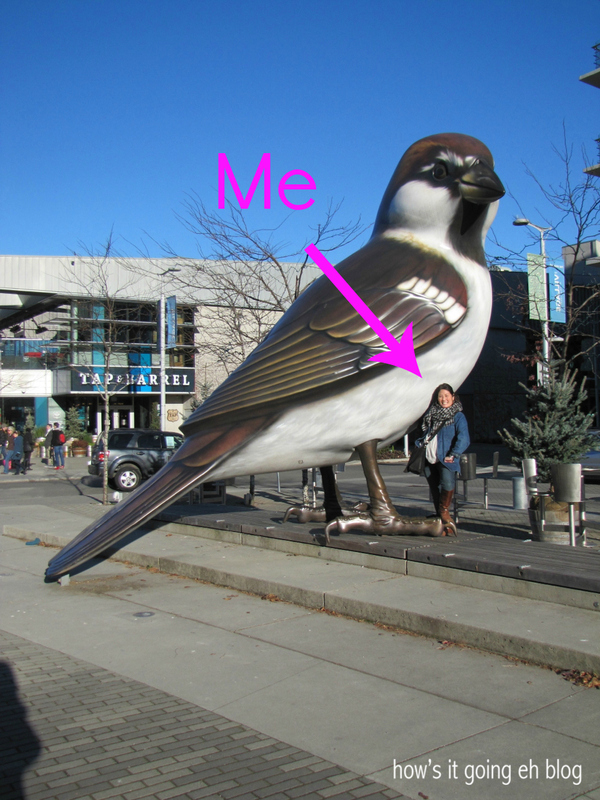 Here I am contemplating the meaning of these large sparrows. 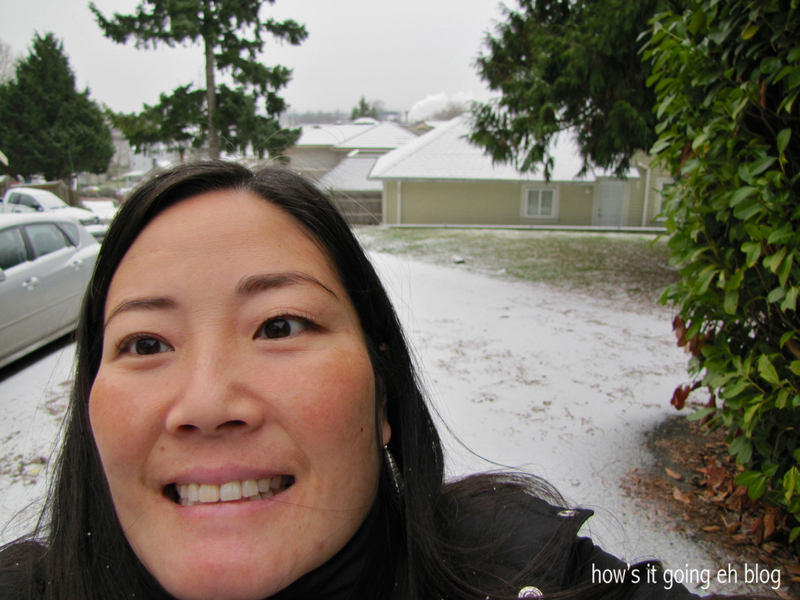 M staged a perspective series…. 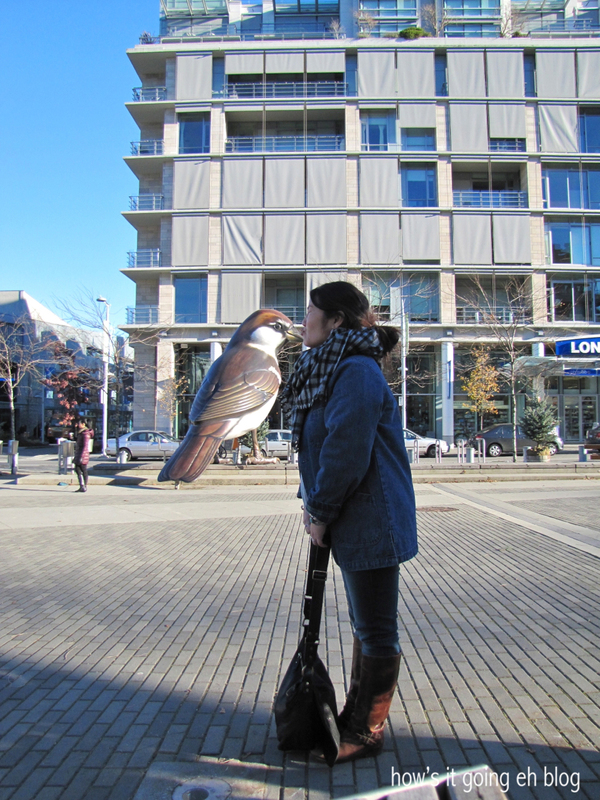 A kiss on the beak! 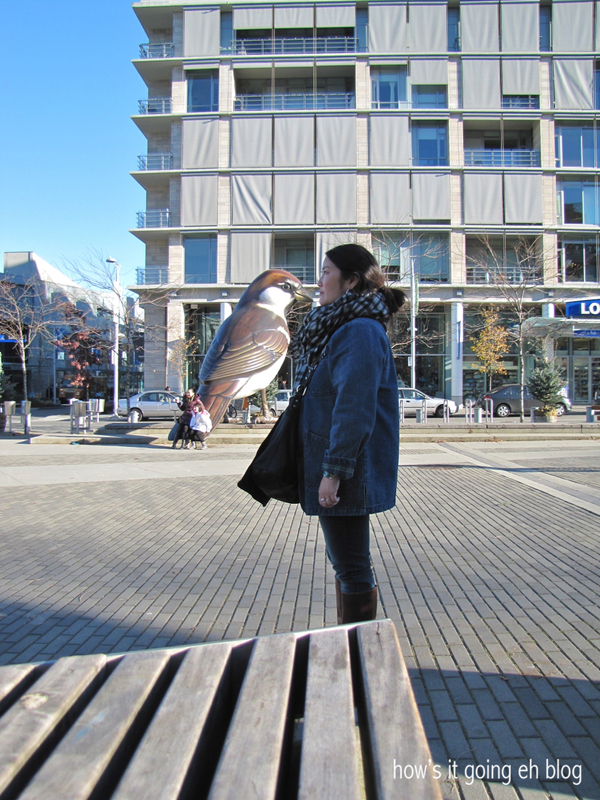 Well, we had some good times at the holiday market + walking around Olympic Village! In other news, the gorgeous break in weather has officially ended! Boom! Two days of snow + ice! It was a light dusting, but still gave a cozy, holiday feel. Hope you are all enjoying December like we are! Stay warm + happy! i love craft fairs too! i just went to the one at Make It at PNE (similar vendors as PW but bigger). I love Taka too, every time i see him i always end up getting a couple cups of chocolates. My favourite is Lemon Basil. Ooooh, Lemon Basil!!! 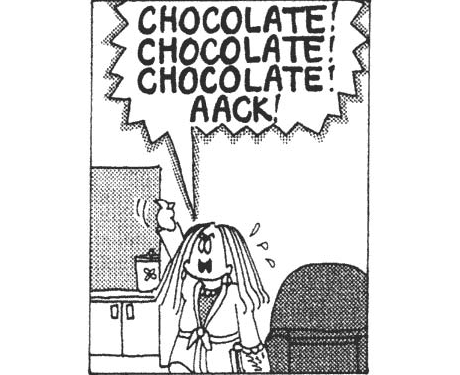 And the chocolates are really well priced too! Next year I will try Make It! let’s go to the next make it! i dont go to PW anymore because it’s the same vendors (I used to have a stand there when it was at the rocky mountain train station) and i think they charge admission too and it’s a smaller venue. PW is pretty small! When is the next Make It? Email me! usually one in spring and fall, so probably around March/April? I’ll let you know! Around + about! Trying to get to know my new city!!! Love you dad, wish you guys were here! I just want him to curl his hair again. Me too..me too, my friend! Canada is full up with moose accessories!!! It’s your moose depot! Those birds are one of the best things about this city! ~M.